Happy November! Guess who won the contest for a trip for two with Scott McKnight? Is it you? Click here to find out! The ODFW information session meeting yesterday was more crowded then we expected. I really didn't learn anything new, it was more of the same things I have heard in the past meetings. What we are going to do. (We have several ideas for raising and redistributing funds). Russell Patterson, (STAC) and Kim O'Tool (Headlight Herald). First off, Lindsay Ball mentioned the closure for the Chetco river. This closure was done for social reasons, rather than any natural biological reasons. The community was in an uproar over people snagging fish in the low water conditions. Therefore, they closed it. Concerning the hatcheries, our main meeting function, the message that "we are not finished yet" still rings true. We spoke about how we keep telling the people that the hatcheries will close. We put the news out, and the people get in an uproar. We work together to do everything we can to save them, only to breathe a sigh of relief... and then find out two months down the road that we have to deal with yet another crisis. We still cry wolf, and believe me, these wolves are real, and I see more coming on the horizon. There is simply no way that we can predict how many wolves will show up in January. Was this a political meeting to get the news out to the people that we must pass 28? Right now, in the polls, measure 28 is heading towards defeat. The amount of money we need to fund the hatcheries will increase by January, and then again by March! Every quarter, more! More! Oregon is often the first to go into recession, and the last to pull out. "What do I tell the people?" I looked straight into Mr. Balls eye and asked, right after he attempted to explain it. His frustration showed clearly. OK! Great! So I don't know what to tell you! I will go through my notes and try to organize and get to you the key things that we discussed, but right now, I have to get dressed and get to my children's conferences at school. The key issue here, is to know that we are not out of the woods when it comes to saving and keeping our coastal hatcheries operating. There will be a tag increase of at least 5.00. They stated it was $5.00 yesterday, but I could have sworn it was 10.00 at the last meeting I attended. We need a $10.00 increase. Heck, we need a $20.00 increase on salmon tags! Think about how much it costs to participate in other sports or leisure activities. What do you pay for golf? A movie? Be prepared to participate in polls that may help us to influence the legislature that there is power in numbers. As few as 200 people could sway them. I need you to keep up the fight, stay positive, and stay tuned! Be prepared to write numerous e mails to the powers that be, to attend meetings that might be called on our behalf, and to know, dangit... that we need to stick together on this one! Remember, when you use e-mail for these purposes, you need to include your district, name, address, and phone number. Off I go... Thanks for your patience! Don't know why, but I'm thinking about my Grandfather today. "And forgive me, please dear Lord, for all my mistakes, and there were many. You know, Lord, that I dislike crowds and the likes with all their rabble and babble. I believe that perhaps, you have spoiled me a little by going with me on every fishing and hunting trip that I ever took. Many were the times, that just you and I, up some winding canyon, with nothing but hush clean up to the brim, save the low moaning of the wind in the pines and the music of tumbling water, interspersed occasionally by the raucous cry of a bird, who challenged not you, but me for being there. And how I loved and enjoyed all of it." After a day of visiting friends, I staggered, tired, emotionally wiped, up the stairs. The house was warmed by a fire, and the sunshine filtered brightly through the windows. I grabbed a blanket and collapsed on the bed. The TV was blaring touchdowns and other miscellaneous football screams. "I don't want to watch footbal!" I groaned. "O.K.! Bill teased. "Let me get out the blindfold and the ear muffs." There are events in my history that makes sunny, cold, winter days bring on sadness. It hit me deeply, and brought it all home, yesterday. Looking out my office window, life appeared so pleasant. The wind bites at any exposed spot on my flesh. Speaking with Linda Krum on the telephone made the sunshine dim, and the whole world seem surreal. Gary is not doing well. It was the first time I'd heard her voice sound resolute, resigned, and without hope. Dang, if it didn't bring back memories of going through my Mother's death from cancer. It hit hard. It was the same kind of sunny, cold, winter day that I'd driven repeatedly, from the coast, to Canby, to observe life be stolen from her. Arriving at Gary's home, memories flashed through my mind of times I'd been there under happier circumstances. Gary and Linda, Bill and I, checking out their new car after having dinner together. Laughing, talking about fishing, joking. Gary's laughter floating through the air, effortlessly. This time was much different. Usually I lead the way into the home. This time, I held back. "You go first." I said to Bill. Quietly, I followed. I wanted to turn around and run. Gary lay in a hospital bed, looking so much like my Mother in her last days, that my head swirled. Bill sat next to him, and wept. He held his hand, and told Gary what a wonderful friend he was. I put one hand on Gary's shoulder, and the other on Bill's. Linda told us that two day before, Gary was lucid. They were fussing over him, a bit too much, and he had growled, "I am going to get dressed, get in my truck and go fishing! I've had enough of this!" "I think Gary is out fishing, Bill." Linda attempted to comfort us. Linda, wearing Gary's wedding ring around her neck, worried not about herself, but whispered to me, "I hope Bill will be alright". I know that Gary heard us. He was asleep, and heavily medicated. I didn't see his eyes open, but I knew that he knew we were there. Bill left the room to go outside to check his emotions. I stayed and hugged Linda and the tears flowed freely. I told her how much I thought of her. How strong she was, what a fine example Gary and her set for her children. I insisted that she let us know if there was something we could do. Dinner? Take shifts so that she could nap? Almost selfishly, I needed to do something for them to make me feel better. We finally crawled back in the truck and drove off in the sunshine. That cold, biting, winter sunshine, that will forever be increasingly dim because of memories such as these. Bill and I are going to get dressed, jump in the truck, and go fishing, now. I guess, with the freezing temperatures, it will be easier to keep a stiff upper lip. 21 1/2 pound hen, the Ghost Hole. I can say that I had a bad day, even though we caught this beautiful hen! I can say that, and so will you, after you hear the story. I arrived home, after fishing much of the day. I had had a lovely day out on the river. However, I am usually "paid back" after putting things off, in order to fish. I had to have groceries. I called Kilchis, put him in the back of the truck, and headed to Fred Meyers. Back through the aisles I went. When I got to the check out they were full. Ah! This new U Scan thing isn't full! I'll give it another try! Bleep, bleep, bleep! I went through the items, placing them in the bag. I used my debit card. This is simple! I realized I had no cash, so added $40.00 to the balance to take home with me. Now, usually, the checkout gal hands you your money, right? I have used U Scan before, but always for exact amount debit purchases. I grabbed my receipt, cheerfully said goodbye to the checkout gal, and left. UH OH! When I got home, I realized, in my hurry, that I had forgotten to get my cash from the clerk. She took my information, rather blandly, and reassured me that they would call in the morning, should their till be over. "But, I was just there! Can't you just ask the gal?" For some reason, not! She was very unconcerned and impatient. A few minutes past and the phone rang. Ah! They found it! She called to let me know that my $40.00 would have been delivered there, right at the U Scan, in a tray, and hadn't I seen it? Hadn't I seen it??? She was a bit incredulous. "No, I didn't see it. I didn't see it in triplicate, either." Since my surgery, things out of the normal don't get seen. Things like road flaggers, and birds, and cash right there in front of me. I began to cry. "Didn't you see it?" played over and over in my head. "Well," the lady said, "It has been stolen then." No big. It's been stolen. It's just $40.00! No big! ARGH! I hung up the phone, and began my work. O.K., I need to make dinner. So, I lost $40.00. That bites, but I must move on. Hollandaise. I was grouchy. WHERE WAS IT? I searched the counters, the truck, oh my gosh! I left it at the stand, in my hurry! I had all my other groceries, but that last U Scan purchase stayed right there! At U Scan in the little plastic tray!!! Now, I did begin to cry. Real, big crocodile tears! I spent 48.95 and came back with nothing but my original purchase! I dialed Fred Meyers again. I explained what I had done, feeling really stupid, now! The manager spoke to me this time. I told him the whole story. He finally, reluctantly, agreed he would give me back my merchandise. Bill, seeing that it was getting dark, and feeling sorry for me, drove the 10 miles back to the store to get my Hollandaise sauce. When he got there, they wouldn't give it to him! They tried to tell him that I had indeed taken my bag, because if I hadn't, the checker would have been notified, due to the weight of my sale, still being on the scale! I didn't/hadn't taken my bag! I know that for a fact! Bill got the feeling that they didn't believe one word of the whole story! Bill dialed me on the cell phone. "We are not doing business at Fred Meyers." He wanted to know what I had wanted, as he was going to Safeway. I feel so violated. So robbed! I was robbed! The next guy/gal at the checkout took home my $40.00 and my groceries! Or-- could it have been the checkout girl? If they can be suspicious, so can I!!! At Fred Meyers, they have new technology that they expect us to learn easily. I didn't learn it easily, and I got robbed 48.95! Is that fair? Their job, at that checkout, is to ensure people get their groceries, and their money. That their transaction is settled and finished, before they leave. It has become more than clear that they have no intention of helping me in any way. My frustration over my eye sight, or lack thereof, was escalated to full scale tears last night. From now on, I wonder if I should just patch my new eye. Perhaps then, I'll be able to make Hollandaise sauce by scratch, and my check book will be much healthier, and I'll see money, and flaggers on the roads. Over and out to the Ghost Hole. Sigh. Things have got to get better. If U have had trouble at U scan, would you let me know? E mail me! Many were the times, Lord, that just you and I, up some winding canyon, with nothing but hush clean up to the brim, save the low moaning of the wind in the pines and the music of tumbling water, interspersed occasionally by the raucous cry of a bird, who challenged not you, but me for being there. And how I loved and enjoyed all of it. Man, what a crazy life! Bill wants to go fishing again! I have tons to do, and I'm so behind! I mean, after all, those eggs he put up are so beautiful! We have to give them a try! Came home from fishing with Pete and Shane yesterday to the sad truth that we have lost Gary Krum. Click here to read what people have to say about Gary. Click here to help Linda as she battles ongoing expenses. I guess it's a blessing that he is in a better place, but oh, how the people he left behind suffer the loss of his love and friendship. I'll never forget hugging Linda, as I left the other day. She stood, weeping, but still strong. Gary's wedding ring dangled on a gold chain, circled around her neck. Gary and Linda were lifetime partners. What a fine example they set for their friends and family. It's going to rain today. Finally, the tears will come. First, a few spatters, and then, by the weekend, a full blown release of emotion. We all need it. The earth's dry, dusty carpet, will be saturated at last. I'm going to go down to the river later, and take before and after pictures of the river. I've really never seen the flow so slow. I'm going to stand in exactly the same place today, and then when the river has crested, this weekend, and click photos. I'll say good-bye to all of the exposed, bleached rocks of summer, all of Fall's brilliant leaves, and the long evening river walks before the sun goes down. No longer will Kilchis be able to get to the other side of the river. What a shock that will be to him, the first time he plunges fourth and finds the current stronger than his stroke! This weekend, we can all say hello to the river's new life, the new song, and the new salmonids that winter brings to our doorsteps. --and Oh, how Bill will miss calling his friend Gary, to join him down on the riverbank, in this new season. I tried to explain to Bill, though, that when I lose a friend who shares the passion of fishing as I do, when I lose someone I have spent hours on the river with, it makes returning to those places all the more special. I feel closer to them out on the river than I do at home, remembering them. Selfishly, I'd much rather have them right there in the boat with me. If that's not worldly possible, though, it's comforting to know that they are in the wind that sways the trees above us, the water that rolls gently under the boat, and in every wild, living creature we encounter on our adventures on the river. And that, my friends, is one of the driving forces that brings me back, time after time, to fish the waters of Oregon, where I have spent time with many friends that I have loved, and lost. Services for Gary Krum will be held Saturday, November 9th, at 3:30 P.M. at Wauds Funeral Home 1414 3rd Street, Tillamook Oregon. Directions: Go West on 3rd Street from Downtown as if towards Memaloose boat ramp. It is on your right, at Elm Street, before the hospital. Potluck at Krum's residence after the service. The huge pacific weather system that was forecast to hit the North Coast of Oregon has been deflected. transitive senses : to turn aside especially from a straight course or fixed direction. I woke up, ran downstairs to look at my rain gage. Oh boy, oh boy, oh boy!!! .01?!? Point zero one inches of rain? Where did it go? That storm that was supposed to hit two nights ago? Was it....deflected? I also received an emergency alert this morning for thunderstorms and a high wind warning for tonight. Think it will be deflected too? What a darn protective high pressure! It's strong! It's been around since, what? May? Enough of the weather worries, I'm off to the doctors office, once again. When my doctor said to me, "Well! See you in two months!" I knew it was up to me, to find a solution. I could wear the weird looking contact that has a hole for a pupil. Then, I'd have to wear another contact over that, and then reading glasses. Yuck. I did research on the internet for three days. I finally found this! Should it be required that every person knows what a Sector Iris Coloboma? Is it dinner table conversation? That's what is wrong with my eye, why I'm refracting three times, instead of one. Why didn't they tell me? Why did I have to research to find out? So... Much to my doctor's surprise, I faxed it to him. I did not voice any frustration, I just faxed it with a letter that said, "Can you please perform this "simple" operation on me? He was out of town. His resident partner phoned me yesterday. I found more sympathy in this doctor. He listened, he volunteered more information. I read quite recently that anterior chamber lenses are contraindicated in Marfan patients. My last lens was a posterior chamber lens. From the get go, I had questioned why they weren't going to do the same procedure. You know, it was successful. Shouldn't we go that route? The doctor remembered this... yes. Anyway, I think I finally got through to him. I think that they are now considering surgery to repair my eye, knowing full well, it might cause blindness. But... it might work too! It might! This time, it would be a more serious, general anesthesia surgery. I will speak to my surgeon next week. So, my brain is full of medical stuff, again, that I'd rather not even be well versed in. Amazing how, in these days, if you want the best care, you must be educated, and learn all kinds of medical terms. I'd much rather not know these things, but I have found it necessary. People wondered why I kept putting this surgery off. Seems every time I do a "simple" surgery, it goes on, and on, and on.... It's frustrating! That said, I'm off to Portland with more optimism than I've had in weeks! There is a chance that I will see again!-- My eyesight has just been turned aside from a straight course or fixed direction.!!! --and you know what I'm going to see? Deflected Rain!!! Deflected Chinook!!! Deflected Storms!!! I am reminded of one of the most important things I've ever learned from the Bible. Not mine. Not the doctors. His. You'd think I'd want to tell the world! I do! But I don't know how to tell it! So many people I've spoken to, and I didn't mention it yesterday. So many have written and asked, "So, how did your appointment go?" Well, it's confusing, and wonderful, and miraculous, and I'm afraid to believe it, but I think I do, but I'm afraid something else will happen, and well... I'm confused! All I can do is tell you, step by step, what happened! For two months now, I haven't been able to see. I honestly think I was in a sort of depression about it. Everything seemed traumatic, and unfair. If you wear glasses, and can't see without them, you can identify, by taking them off, and trying to go about your business. I saw triples of everything, and they were all blurry on top of it. This, combined with one fairly good eye was very disorienting. I panic when I drive lately. I mean, real panic attacks. I have to pull over and breathe. I wondered why. Well, duh! It's simple! I can't see! So, I asked Pete to help me get to my final destination yesterday. I met him in North Plains. He drove me to the doc. Having spoken with the surgeon, and coming to the realization that I had to have surgery, I wondered, and asked aloud, "Pete? Why am I going to the contact guy today?-- Why this appointment?" I walked in, and he started trying on prosthesis contacts, with another contact over the top. I asked him, "What would happen if I only wore the contact that refracts my vision, rather than the prosthesis that occludes my pupil?" He answered that it wouldn't medically work. That my vision would be clearer, but I would see more clearly the three images that I see blurry, and that it would drive me batty. Nonetheless, he let me try it. I opened the door to his office and escaped to the window, overlooking the parking lot. I went nuts! I saw, like I hadn't ever in my life seen! "Pete! There are pine needles on the tree! Pete! Look! Pine cones!" I had never seen pine cones in a tree! EVER! I stood in the parking lot. The same parking lot I have driven to for 15 years, and noticed a bridge. "Pete, is that a bridge?" It was! The Ross Island bridge, and I counted cars on this bridge! I saw houses PAST the bridge! Everything was vividly colored, from the white white of a wet, rain slicked automobile, to the bright yellow of a warning sign. I could read the letters on them! I did not see in triplicate! I saw slight "ghosts", but combined with my other eye, they seemed to melt in better than before. I ran down the hall, touching things, looking at detail, at little white flecks in the parking lot asphalt, I studied the texture of the walls, the weave in the carpet, the electric colors! WOW! I finally went back to the doctors office. He let me go home, with both the prosthesis and the contact. For now, I'm going to just wear the contact. I have to ease into it, though, and wear it only 2 hours the first day, adding an extra hour each day. By Sunday, I can wear it all the way to Astoria to church and back! I can't wait! I so hope that it's going to be true! I can't really believe it, and I'm so frightened that something will happen. On, the way home, it hit me, and I cried. As I stared at the neon brightness of "flagger" signs, and the beautiful golden colors of what remains of fall, I realized it. Please, don't make fun. I believe this with all of my heart, and I was embarrassed I hadn't given credit, where credit was due. My Christian friends had told me that God could heal me. I argued. I showed them the medical truth, obvious to see. Visually, they could see it too! My iris was torn, and my pupil all screwed up. What? I thought bitterly. Was God going to step up, and one morning I would wake up, I'd look at my eye, and it would be all sewn up? RIGHT. The doctor cannot explain this. There is no medical reason this contact should help me. I had to pull over. Had I been healed? "Is this God's work?" I phoned my sister and asked. Today, I get to "see" for three hours of my choosing, and I couldn't sleep last night trying to figure out which three hours I'd choose. I've picked the first one. I'm going to put it on before I take David to school. Then, I'm going to drive to Bay City to watch the waves. I'm going to see them, you guys!!! I'm going to see the fluffy tops of rolling white, powerful water, complete with lacy, foamy spray! Then, home to see the river. Will I see it better? Will I see fish? Then, to my computer... then, to see if I can see birds better, then to hunt chanterelles, then... Oh wait. That's too much time! Dang this is hard to wait to see! Anyway... I am thrilled, excited, renewed and pumped! I am still guarded about this miracle. But for now.... I have three hours of sight. I have some planning and thanking to do! I think back to my losing $40.00 in the U Scan... That's a pretty fair price for sight. I don't know how you people do it! Do you know how inundated with information you are? I read somewhere about how many minutes per day we are inundated with advertising. It's true! Now, with my new sight, I am seeing so many things! There are stores in Tillamook I had no idea were there! I'm a fanatic with signs now. Signs, signs, everywhere! Road signs that I never could read! I drove to Astoria yesterday, and learned little road and lane names that I could never read before! What's strange about it, is that I find I have to say them out loud as I read them! I was talking on the cell phone while driving, (I know, that's bad.) and kept interrupting my friend by inserting "curves ahead, 45 mph.... yes, and there are 15 boats out in the Ghost hole, no fish on... McNamee Lane.. Oh yes, Andrew is fine, and he is doing well in class... STOP!" My definite favorite are stop signs! They are so bold! They are so... red!!! Tillamook is so extremely "fishy" this time of year. It's so exciting. There are boats, I'd say, probably 1 in 5 vehicles in town. Cars are stacked 20 deep alongside the highway where the slough goes under hiway 101. People in the grocery store wearing waders and rain gear! Marie's bait shop is humming with activity. Do yourself a favor, by the way! If you are new to town, and come to fish, don't just stop anywhere for bait. Learn a local's secret! Go visit Marie and Dennis at Tillamook Bait Company! Turn to the right in between Shilo and Tillamook Sporting Goods, go down over the railroad tracks and you'll find it on your left. Another secret... Stop by Killer Koffee, across from Safeway, and pick up some Amerman Eggs. Have a latte while you are at it! Marie has some dandy looking eggs, also! The river, out back, is getting into shape. It was so fun, the other day, to watch the spawning salmon run upstream, and work their way through the riffles. I fished for a bit, with a bobber and a green and pink jig. Whammo! Chum salmon on! That was fun! I also took my new TH rod out yesterday for a trial run. It was amazing! I can cast an 8 weight, with a weighted fly! Of course, the weight forward line helps. I didn't catch anything. I got soaking wet, but it was fun! The Ghost hole is still putting out some fish. Local's secret: Stop by Garibaldi Bait and store for your herring and last minute supplies. Have a chocolate chip cookie too. Oh, my gosh, are they good! :) Their service is really friendly, and they'll let you know what is happening on the bay. On a more somber note, the service for Gary Krum was beautiful and touching. It was fun to watch an old film clip with Doug LaMear during the service. It was great to see old friends. Afterwards, we met at Linda's for too much food and more visiting. During the service, I noticed the back of a beautiful blond woman. How elegant she looked! Stunning! Her hair, swept off of her neck, and loosely pulled into a bun. Who was that woman in the front? It was Shana Juarez! When she got to the party, I had her turn around. "Yip! You are the lady with the elegant hair! It was you!!!" What a class act Tim and Shana are! There are beautiful women that fish!!! ..and she can catch fish, too! Tim and Shana showed up at Linda's and I shared with her my miracle. "Shana, I can see! :)"
This morning, I'm going to go after Mr. Spotty with Bill. Not sure where yet, but we are just going to get the boat and rods ready and go! I get to wear my new contact for the whole trip! I'm up to 6 hours, wearing my new eye! I can't wait to really SEE my bobber go down, or my rod arch as a snowbelly grabs my K 16!!! Wheeeeee! Tis the season to be fishing, fa la la la laaaaaa la laaaa laaaaaa laaaaaa! I'm so happy I make myself sick! 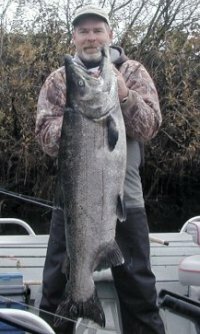 Marty Peterson, 40 pound salmon! Who is this handsome man? Why, it's Marty Peterson! Yesterday, cruising through tidewater, we spotted Marty, and anchored up next to him. He had been fishing for an hour or so, and he held up this beauty! Wow!!! Wouldn't you anchor up next to him too? We wanted some of that fish luck to rub off on us! If you want to get in on some of this action, and have a most excellent adventure, you can e mail Marty here! His phone number is: (503) 842-8813. He is practicing for the North Coast Salmon Rendezvous, so he is dang serious right now! I couldn't resist asking this young fellow if he'd mind posing for a picture. He was so proud of his catch! I wish I knew his name, but I couldn't take a picture and notes, as we trolled by! Congratulations to him, nonetheless. This Dad is making memories that will last a lifetime. We had a great day yesterday! We ended up with a nice salmon in our boat too, but nothing like Marty's! One thing I found out though... I cannot fish a whole day, make dinner, clean house, and be Mom, too. I have to catch up today!!! Help! I'm so behind! Winds are expected to be up to 50 to 60 here on the coast. It's a perfect day for me to catch up! I was a whirling, housecleaning, web mastering, kid tasking dervish yesterday! I caught up on so many tasks! Take a peek at the new Tillamook Bait website I worked on yesterday. Marie and Dennis are pleased! YAY! Now, it's on to trying to make space for new advertisers, adding a website for another Alaska location, (to be announced)... and adding a new category to ifish: Top Rods. I also have to clean bathrooms, write some thank you notes that I have forever put off, and order some decals. When I was young, my parents made us write Thank You notes before we could enjoy anything we got for Christmas. Now that I am an adult, I stretch that rule out way too far. For me, anyway... My kids? Do as I say, not as I do! I took a break yesterday, and walked along the river in 40 mile per hour winds. Some see Fall as the season of death, but life was all around me! Salmon were splashing in the shallows, making their way upriver and spawning in the riffles. The bank was carpeted with beautiful yellow and red leaves. I stood under a maple tree as late falling leaves swirled wildly around me. Clouds moved at a furious pace above me, changing the sky from black to bright blue. I couldn't help but stand there and giggle. I get such a charge out of the colors, and the wind, and the rain, and all that shines on the rain slickened riverbank. Give me a bobber. I have to go to physical therapy now! I am overwhelmed with projects, both at home, and here on ifish. "If your checking account is overdrawn, go out to lunch!" "If you have so much to do that you can't think clearly, go fishing!" Honestly, though, I think I need time to sort out how to wade through everything that's in my head. I will take a notepad and start writing my thoughts and organizing, on the river, between bobber downs. PS. My mail box is full, and I will get back to all of you as soon as I've filleted the fish and cured the eggs. Had a grand time the other day, landing salmon on a K 16 wrapped Kwikfish, retrofitted with a Mustad Triple Grip. Those hooks GRIP! The 16's shake the leaves off, when there is lots of debris in the water much better than a 15. If you want to learn a little bit about when to use snaps and not to use snaps, head over to Stan's new Column. I've always struggled with whether to snap, or not to snap. In the middle of the night I padded across the bathroom floor, barefoot, as I often do. I slide open the tiny window that overlooks the field, and scan the area with my high powered spot light. I have no gun! I'm just spotting for elk, or deer, or any shining eyes in the dark. It's a great treat when I come across a herd of elk, grazing in the stillness of the night. The stillness of the night? It hit me. It's four in the morning, and not a breath of wind. What happened to our storm? Deflected or delayed? I guess the Coast Guard tower in Garibaldi is reporting 45 MPH winds right now, but the canyon remains breathless. My e mail box is full of EMERGENCY alerts about the high winds. It's exciting! The boys prepared the trampoline, by digging a hole, burying a log, and tying it down. The trampoline is ready. I unhooked all my outdoor plants, and set them on the ground. We are ready! Let's hear it, storm! Sweep the leaves from the trees! Change the river from a slow sweeping current to rocking rollers! Yesterday I had an extremely peaceful day, with no one home except Kilchis and me. (Not Kilchis and I, Kilchis and me. That is grammatically correct!). Dee Dee went with Bill, to Portland, and the kids were at school. I didn't take a shower till 10:00! I lounged around, eating disgusting raspberry filled powder sugar donuts and leisurely worked on some web pages. What? What is this? There is wind! It is 7:03 in the morning, and the wind has begun! Time to go build a fire, make some pancakes and bacon for the kids... It's Saturday morning... I'm going to open all the shades, and watch the season be stripped from the trees! The seasons, they are a changin! I am sore from head to toe. I was in such a panic to rescue the trampoline in the windstorm yesterday, that I could have lifted a Volkswagen! Here is the continuing saga of trampoline number two. I'm not playing for church today. Bill has the boat hooked up. Guess that means we are joining the weekend masses on the river. Wish us luck! I'd kind of rather stay home, and go to The Nazarene Church, here in town. I rarely get the opportunity... But I have no other day to fish this week. Appointments every darn day till Thursday, and then The Rendezvous begins. Off I go, the wind is calm... I can't believe that storm! It lasted about 15 minutes... almost like a tornado around here! Had a great day yesterday, working, going to Physical therapy, and then fishing out back. I actually didn't fish much. It was great, though, to witness a spawning celebration! You could see, clear as day, the hens digging the redds, and the bucks darting wildly around them. It is mesmerizing! I didn't even notice them, until Shane pointed them out to me. Then, wallah! There they were! I came inside, soaking wet, built a fire, and began to tend to a not so fun task. 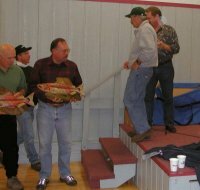 Kilchis began regurgitating rotten salmon. He has a fever, and we are watching him closely for Salmonella. We thought he had it last year, but we may have given him 'the cure' to soon. If that is the case, he wouldn't have built up enough resistance to it. He seems better this morning, but man, was he soggy last night. 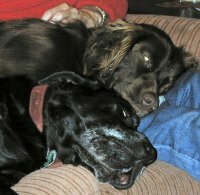 Dee Dee, (the black lab) is always that lazy, but it is a rare moment in history to see Kilchis this zonked out. They were so dang cute together! I can't believe we got 2.33 inches of rain since last night! Yowza!!! The river sounds like Niagra Falls out there! Can't wait to peek! Thank God for you people at ifish! The Legacy Emanuel Children's Hospital will be a lot more cheery this Holiday Season, thanks to you! If you don't know about it, we are meeting, December 4th at 6:00 PM, at Pietro's Pizza in Milwaukee. All attending are asked to bring a gift from this list. Please check for updates by clicking on this thread. It would be lovely to know if you plan on attending. If you cannot attend, and would like to help, please call Jessica Walsch at Emanuel. Her number is: 503.413.2808. She is set up to take visa and cash donations. Just let her know that it is an ifish donation, and she'll know what to do! I have to go to the dentist. After, I was going fishing, but I betcha anything the rivers are too high. I had the most wonderful feeling yesterday, as I walked along the river. Youth had returned! I was lost in a land of discovery, finding precious agates, splashing in the rain and river in my knee boots. I was shin deep on the flooded banks, and salmon were darting between my feet! It was darn near the same feeling I had as a child, in many different stages of growing up. I was perhaps 13, or 14, when my friends and I would meet down at Canby Park after school, to build a dam in a creek that fed the Molalla river. Rain, sleet or snow, we worked, (actually played), until the sun went down. We were wet, cold, and hungry, but especially distracted by our chore. Other little girls were interested in boys and dating and such. We wore jeans, and overalls and boots, and pitched rocks here and there! The smell of a home cooked meal and a warm fire in the fireplace greeted us, as we opened the door. Fingers froze, we screamed and giggled as we ran our hands under the faucet to thaw them out. "Can Judy Stay for dinner, Mom?" She was always welcome, and afterward, we did our homework together, on the kitchen table. It was home from school, directly to the garage to get my bike, and ride 4 miles out into the country to ride my horse. Of course, it wasn't my horse, but I called it mine. A friend of my Mom's gave me permission to ride, and boy oh boy, did I take her up on that! Every day, the same. Soon, I did begin to "grow up." I met a boy at school named David, and long hours were spent on the phone, or curling my hair, or putting on makeup. 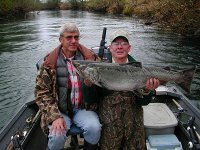 Thank God, David loved to fish, and we also spent long hours together driving up the Clackamas, or to Eagle Creek, or to Lost Lake. David taught me to tie leaders. I remember my first knot. He took it and carefully examined it. Then, he pulled on it, and it broke. "Better now," he said, "than with a fish on." Although it angered me, he was right, and those words flash before me, as I tie knots today! Yesterday, as I spent hours on the bank of the Kilchis river, this all came back to me. The river, which had survived the pinch period, was full of life and change! It woke my soul and brought me back to that wonderful feeling of being lost, and alive, and curious! I stood still in the current, with my camera, until a wandering salmon came close. I couldn't figure out whether to stare at it, or click a picture! I found totally translucent agates, that had been overturned in the first strong current. Kilchis found a huge fresh salmon head that someone had tossed into the current. Life it too short. The days, without enough light. I glance at my Day Timer, and my scribbled list of tasks. It gazes at me, boldly, with too much importance. I lean over and scribble at the top of the list, "RIVER". It is vital, much too important, to forget to play. I've never been a heavy weight, when it comes to staying up late, having even one drink, and getting up to fish all day at O dark thirty!!! But, I can do this!!! I was picked as a sit in for the Oregon Wildlife Heritage Tournament, and I accepted. You know why? Cuz I can do this. I'm supposed to have breakfast at 5:00 at the Shilo, pick up my lunch, and Terry's lunch, and then meet him at our put in. You know, I'm exhausted, my bones ache, and there is crud in my eyes. The kids have nothing for supper, and I can't take David to Jazz Band. We are fishing in heavy water... never my favorite, but as I'm sure you know by now... I can do this. Not only can I do this.... but I can win this tournament, too. Yes, John Steele and I will win this tournament!!!! Shower time. Move body, move!!! Spent the day out at The Ghost Hole with Terry Mulkey. What an awesome guide! No, we didn't land any fish, and it was extremely slow out there. The ocean was rough, and we could only make it out to the tower. There were huge swells all the way into Lyster's. We fished ALL day, with one bite. Nothing around us. John Bowles hooked one, and that's the only fish we saw taken. Talked on the cell phone to alot of other guides, and it sounds as if although a few fish were taken, it was all in all a slow day on the rivers. 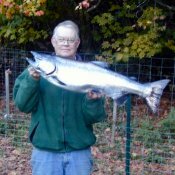 Best I heard was from my very own, Bill Hedlund, who got his clients into 2 nice chinook, and lost one at the boat. Anyway, I'm so tired! Kilchis wants to run, and I want to fall on the floor. But no! I can't fall on the floor! It's time for the banquet and auction! There we will draw our guides for tomorrow! Last night, I was exhausted. My head was weaving back and fourth just inches from the dinner table. My eyes were half closed. Wisps of hair dangled in the whipped cream on the cheesecake that I couldn't finish. "Number 903239!" I bolted upright. Rod Brobeck broke my trance by calling out the raffle numbers, one after another, at The Oregon Wildlife Heritage banquet. I groaned, as I pondered the early hour at which I was to join Chris Vertopoulos on the river. Chris, full of energy, excitedly explained to me that he was in second place, since Gary Hilton could not fish today. We were to meet at O' dark thirty to beat the heavy traffic on the river. He could win the Tourney! "It's almost that time now, Chris!!" I was overcome with a most generous thought! There must be a hard worker in the tournament background tasks, here, that hadn't gotten a chance to fish yet! The auctioneer! He could fish, right? How bout Andrew? He's lucky! :) Lessee.... who? Who? Who wants to take my place? It ended up that Rod could fish with Chris, and Jennie could stay home! Can you believe that pickled me tink? I am! I'm pickled tink! I can catch up on decal orders, and web work, and most of all-- restful peace and quiet on the Kilchis river! Don't get me wrong. I've always wanted to fish with Chris Vertopoulos, and he said he felt the same. So we are going to do that. I'm just not very good with regimented schedules, nor extended periods of heavy social activity. Something in me requires time alone to breathe my own air. My body ached from holding 12 ounces of weight on a rod in heavy swells, and then dragging 4 ounces around the Coast Guard station. It felt good to go to sleep last night and know that I didn't have to get up at 3:00 A.M.. It feels good to know I don't have to do guilt about not getting David to jazz band in the morning. If I had gone, he would have to skip the class. That didn't set well with me. "Sorry Dave, Mom's fishing, and that's more important than you?" So, as it is now, if Rod has to go back to work later today, Chris will call me, and I'll hike up to the place he is anchored and hop in the boat to cover for him. I'm happy. Chris is happy, David is happy, and so am I!!! 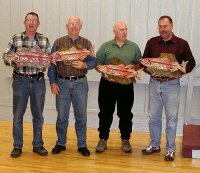 I've thoroughly enjoyed being involved in the tournament, and socializing with my favorite fishing people. Question: If I happen to catch a 50 pound salmon out back, can I enter that in the "big fish" category? I just got in from fishing, feeling quite like a healthy, normal kinda girl.... when my eye surgeon called. Anyway, I was so glad to talk to him. He had time to discuss things with me. However, now I am left feeling fairly fragile, instead of the girl who was out, just this morning, standing thigh deep in swift current, holding a Kwikfish and waiting to battle a salmon. He said, "Jennie, of all the Marfan patients I have worked on, your eye was the most fragile I have ever seen. Your eye tissue literally fell apart as I worked on it." Now, that is a visual I could have done without!!! Perhaps that is why he had told me earlier... "Jennie, not only do I not want to do further surgery on your eye, I loathe the idea." Today, he further noted that the eye he had fixed for me 5 years ago was much stronger and more resilient than the eye he just attempted to work on. What he said next brought shivers to my spine. "Jennie, what I wonder, is if this last eye has always had weaker connective tissue, or has all of your tissue deteriorated in the last five years?" Something I thought would never bother fleetingly spooked me. Is that organ that so strongly pumped blood, and has enabled me to live, to have children, to laugh, to play, to fight salmon, to bring in a large sturgeon.... Is it weaker than it once was? Everyone knows that people with Marfan Syndrome are at a high risk for aortic dissection. Everyone knows that, but I have chosen not to believe. Doctor... I think that my other eye has just always been weaker. Let's just go with that! All these years I have bragged that the doctor told me I would die if I had children. I had two! They said I would be gone by age 35. I am 42!!! Despite a fleeting moment of fear, I have decided to forget our conversation this morning, and go on defying the odds. I'm going to be out this afternoon. Out in the water, holding a Kwikfish, hip deep in the Kilchis river, waiting.... with a deep appreciation for life, for nature, and for all that breathes, and swims and surrounds me with profound and beautiful life! Dang, I love to fish! I have to hurry up and do it!!! They are coming.... They are here! Many reports of steelhead being caught in the area! Whooo hooo! What does Thanksgiving mean to you? Oh! Thank you God for steelhead!!! 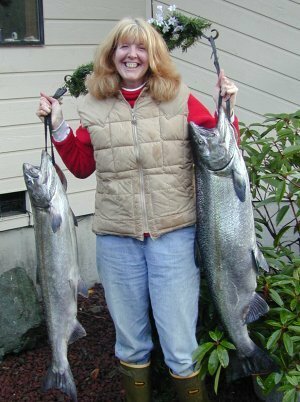 Now, all I need is some time to go play mighty steelhead hunter woman! Rod Brobeck, and Bill Hedlund, second place. Gary Hilton, in the grey sweatshirt, first place! I just thought I'd tell the entire world that I'm cranky today. There. I did it. As I finally approached the head of our Kilchis river property, the surrounding trees loomed larger than normal. The drive had been long and slow, due to ice on the roads. Somehow, however, I enjoyed the drive. It helped me more easily adjust to the dramatic change from city to country. I was tired, after two days in Portland. Tired of waiting rooms, visiting doctors, and listening to all kinds of medical opinions. I didn't not feel well, myself, and fought traffic that reminded me of Los Angeles in the eighties. The canyon meadow was still covered with ice, well into the afternoon. Long shadows of hemlock, spruce, and alder stretched from their base, across nearly two city blocks of grasses, and into the river. Their darkness then melded into the quiet flow of the river. Such an extreme change from the rush and crowd of the city. How could this be? Two hours of travel, yet a continent of change away? I stopped on the road, and peered into the shallow depths of the first pool. Where sparse sunlight danced on the riffles, I spotted several Chum salmon! Their characteristic white spots caught light as they came into view. They darted in and out of the light, playing their spawning ritual. 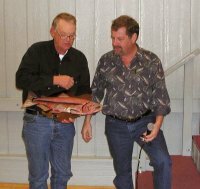 I remember asking Bill, way back, "How will I know if I catch a chum salmon? What do they look like?" All he said was, "You'll know when you catch one!" He was right. Once you've seen a chum salmon, you will know! They have become part of my holiday. Despite their less than favorable table fare, or the fact that you cannot retain a chum salmon, I find them fascinating creatures. A river mark of my favorite season. Midway on Kilchis River Road, there runs a creek that feeds into the Kilchis river. The small stream is thick with brambles, and now, successfully planted with willows. The vegetation provides wonderful cover for chum salmon. On the way home, I can pull over and peer into an exposed piece of water. 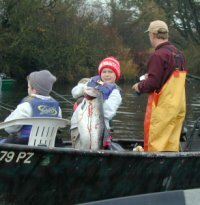 Every year, at the first of November, I begin to check the waterway for the first chum. For several days, I'll have David check as I drive him home from school. "See any?" Just as a child, "Are we there yet?" The answer is no, for several days. It is a holiday, of sorts, when the kids or I spot the first one. A tradition in the making. After the first spotting, we begin to see more and more chum, until the holiday is in full spawn! Once, in this small creek, that is barely three foot wide, and visibly stretches only ten feet long, we counted twenty chum! In this season of Christmas, and Thanksgiving, and everything Hallmark, it is so nice to have a holiday of our very own. One that perhaps, more closely matches my personal joys. From Christmas decorations in the malls, I had traveled to a land where we decorate our rivers with chum salmon in appreciation of the season. Late in the afternoon, I pulled a box out from underneath the garage stairs. I decorated one of our bird feed stands with greens, and berries, and bright red ribbons. It stood so brightly amongst the faded trees of November that surround our home. --And may all your rivers, be filled with Chum! Andrew, David and I had an enjoyable, relaxing Turkey Day. Bill was with his Mother, in Portland. The sun was shining, the temperature so warm that we didn't feel like building a fire. It was a feeling nearer to spring, or late fall, than any Thanksgiving I'd ever experienced. As the afternoon grew longer, a slight chill set in that gave license to build a fire. I put the turkey in, in the morning, and walked out to the river. Man, it was low. I brought a spinner with me, just to see if anything was alive in the upper hole, which is the only place I know of, that has 12 feet of depth, and enough current to cover a fish. As I walked upstream, I could see the entire structure of the river bottom from shore to shore. An almost dead chum spotted me. He attempted to find the energy to dart and hide. There was no where to go. I looked away, so that he wouldn't feel so exposed. First cast, I had a violent grab. It was a cutthroat, and a large one. I was so intense on getting him in, and removing the hook, that I didn't enjoy the fight, nor take any time for measurements, once at hand. It was not a cutthroat that I had targeted, and I was worried for his life. The hooks had pinned his mouth shut, but Thank God they popped out most easily. I attached the spinner to the cork on the rod, and decided instead to throw sticks for the dogs. The dogs easily retrieved any stick I challenged them with. Where is the heavy current and green/brown water of winter that teased me, only 10 days ago? "Uh... Summer? This is Winter's turn, now!" Bright, sunshiny days, with warm temperatures, and cutthroat in the riffles... An odd mix, yes? With no leaves on the trees, salmon spawning in the rivers, and holidays to celebrate. I'm seasonally confused. And so, I believe, are the fish. I'm going duck hunting in the morning! I can't wait! Kilchis's first duck trip! That is, if I didn't put my back out. I hurt all over! Too much physical stuff today. I woke up this morning to mess! I guess Dee Dee had to go to the bathroom in the middle of the night. She had to go really badly. So, she did! All over the carpet! Not in one spot, mind you, but in.. oh... say 30 spots! We are not talking about liquid here, either. What was worse, is that it was almost liquid! YUCK! So, I spent the day shampooing the carpet with a machine from Safeway that almost worked! I had to call the 800 number three times. They said the machine was 8 years old, and had Bill and I playing mechanic on it all afternoon. When life hands you a mess to clean up, you clean it up! Afterwards, I lit a fire, the carpets all sparkling clean, and made the same turkey soup that my Mother made every year. (God rest her soul.) I haven't had it since I was in high school. It's simmering on the stove now, and I think that you guys all have to make it too! It is SO wonderful! So, here is the recipe. Please make it, and please let me know what you think of it, by writing to me here! Once the soup is thickened, keep it at a simmer without boiling. Form the meatballs into 1 inch balls, and add them to the soup. Cook until the meatball is cooked through. Serve with brie, fruit and toast points! You'll have a better day tomorrow, if you eat this tonight!